... I rode a horse to school! 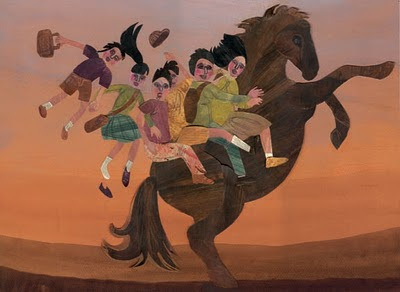 I love the action in the horse and the kids flying off at the end, even the shoe! And the curve to the background adds to sense of motion. Wonderful. this is incredible. I love the texture! For anyone interested I am holding a writers and illustrators retreat in june. Do you go Bananas for Illustration? Keep track of us here! Darryl Funk- "When I was a Boy..."